Warmth for your lower decks. Runs Bigaria-label="A rating of 1 means too small, a rating of 5 means too big, a rating of 3 means true to size. This items average rating is 2.6. Defend against numbing cold over long days outdoors or during periods of low activity. 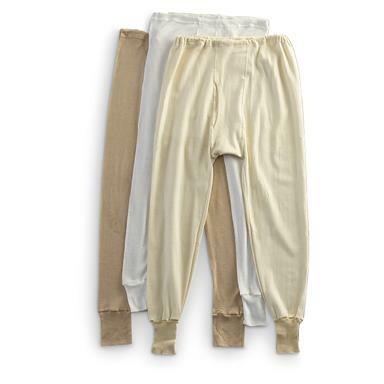 These cotton Long Johns help manage core temperatures so you can focus on the mission. A smart investment for winter chores, hunting stakeouts or ice fishing. You get 5 new pairs, all made to strict Czech specs. Czech Military Surplus Long Johns, 5 pairs, New is rated 3.3 out of 5 by 16. Rated 1 out of 5 by Pinesman from I thought the price was great. Very thin, but it is an extra layer. I was surprised they did keep warm with jeans, parka and very good boots walking in 32 degrees, slight wind and light snow about 1/4 of a mile from my warm car to my warm house. Rated 2 out of 5 by Tonto from Wimpy Waistband Nice fabric, great price, but basically disposable since the waistband was shot after one washing, even though they otherwise fit well. Rated 5 out of 5 by RI Deer Hunter from Comfortable and warm They are comfortable and a nice base layer. Not too thick and bulky. But they did smell like moth balls when I got them. Rated 5 out of 5 by bc_trader from Great Product Very comfy !!! Rated 4 out of 5 by MrDrew from Good price This item was what I needed and the price for them was a good price for a set. The only thing that I did not realize was that it would be an open front with drawstrings. Rated 5 out of 5 by Ron the old guide from Excellent value Can't beat the price nor the value-I received excellent items,individually sealed in plastic bags, that fit well and did have elastic waist. Rated 5 out of 5 by jojo from It is an great price for long johns I love my 5 new Czech military long johns, khaki, they are warm and fitting and I try to find some long johns tops to go with them but could not fine any. Warm military layering for a surplus price. Cool, breathable extra-long base layer. A bulk supply of military-grade underwear.